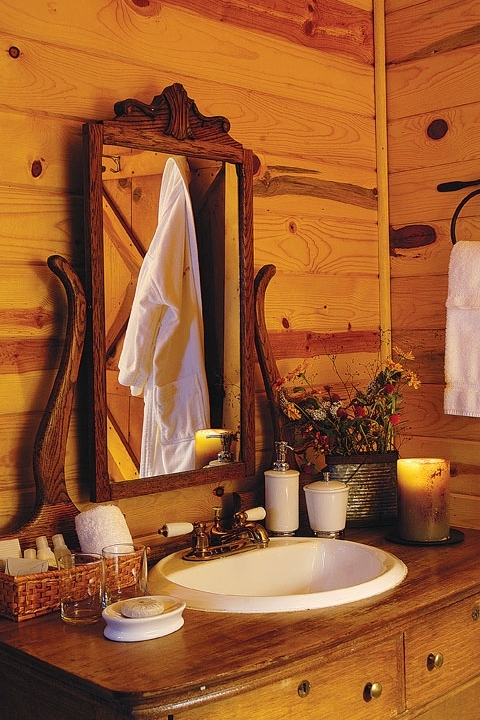 Our historic deluxe cabins will provide you with a classic Western experience. We offer three different deluxe cabins for you to enjoy. Each floor plan offers its own personality and charm; all richly appointed with Western themes, warm comfortable furniture and other thoughtful details. Don’t be surprised if you find yourself torn between putting on those waders and settling down on the porch with a good read. While we know you’ll be going fishing, you will find the warm historic Western décor, comfortable furnishings, and spectacular view both relaxing and inspiring. Here it is easy to surrender yourself to the warm, tranquil, quiet environment that surrounds you. The light pine walls, historic black and white photos, and antique, plush furnishings are at once comfortable and reminiscent of days gone by. This cabin's richly hued log walls, exquisite Native American art and solid comfortable furniture will remind you of a simpler time and provide a peaceful respite. A cool Montana evening after a long days fishing is a good reason to open up that complimentary bottle of wine and stoke up a fire in the stone fireplace.